Two years ago, the celebrated Olympic hero and famous reality TV show dad then known as Bruce Jenner revealed to the world in an exclusive interview with Diane Sawyer that he had struggled his entire life with gender identity. Now, two years later, Caitlyn Jenner has fully transitioned to living as female. She detailed this journey in her new memoir, “The Secrets of My Life,” out on April 25, and sat down with Sawyer for a second exclusive interview to talk about what becoming a woman has been like for her and the highs and lows along the way. When she ventures outside her Malibu home, Jenner said she’ll take 20 to 40 selfies a day with strangers who walk up to her. Even a typical trip to the supermarket is met with people pulling out their phones, asking for photos with her. Jenner said she tries to accommodate all of them, no matter who asks. Once she began her transition, Jenner traveled a long road of hormone therapy, surgery and dealing with a world of criticism from all sides. Caitlyn Jenner--formerly known as Bruce Jenner--on the cover of the July 2015 issue of Vanity Fair. “My feeling on that picture, I know, my kids that thought, ‘You know what? It’s a little too much,’” Jenner said. “But from my standpoint, I had suffered for 65 years, OK? To have a beautiful shot of my authentic self was important. Four months after that cover came out, Jenner took another brave step into the spotlight when she appeared in a long, white gown in front of 6,000 people at the ESPY Awards, a ceremony that honors excellence in athletic achievements. On stage, Jenner, who became a national hero after she won the decathlon at the 1976 Olympics, faced her peers as a woman for the time as she received the Arthur Ashe Award for Courage. 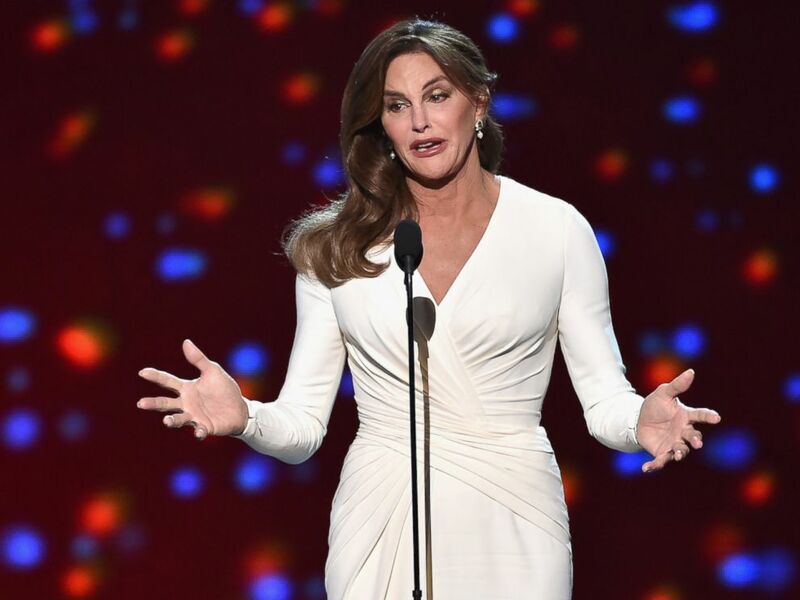 Caitlyn Jenner accepts the Arthur Ashe Courage Award onstage during The 2015 ESPYS at Microsoft Theater on July 15, 2015 in Los Angeles, Calif.
“I had been to the ESPYs so many times ... kind of a scary place to go,” Jenner said. She said she only got through the speech by thinking about the thousands of transgender people across the country who live in fear of bullying, homicide, discrimination and ridicule. According to the National Center for Transgender Equality, in the largest national survey of transgender adults, 40 percent said they once attempted suicide. Back when Jenner first emerged as Caitlyn, she said she did so with optimism and was unprepared for what was to come. After Jenner spoke out two years ago about being transgender, dozens of young people came forward to share their stories. Growing up in Tarrytown, New York, in the late 1950s, Jenner said she was about 8 or 9 years old when she secretly started wearing dresses from her mother’s closet. She kept this to herself for years, not knowing who to talk to about it at a time before the internet existed. After becoming a household name for winning the decathlon at the 1976 Olympics, Jenner became a motivational speaker and said she would sometimes go out on stage secretly wearing a bra and pantyhose underneath a suit. For decades, Jenner’s first two ex-wives and sister Pam Mettler kept the secret of her gender identity struggle. The circle expanded two years ago when Jenner told her mother and her children. Jenner has six biological children -- Burt, Cassandra, Brandon, Brody, Kendall and Kylie -- and four stepchildren -- Kourtney, Kim, Khloe and Rob Kardashian. “I thought that most of my life,” Jenner said. “I said, ‘If I go and when I’m buried,’ yeah, I wanted to be dressed as her because that’s the way I was going to heaven. “I would say I would kind of shock everybody when they come and visit the casket,” she added. In her book, Jenner describes the years of trying to deal with this internal struggle. Shortly before she came out publicly as transgender, she underwent facial feminization surgery. Only a small percentage of transgender people go on to get what is called the “final surgery” or “gender confirmation surgery.” Jenner wrote that she had the “final surgery” in January 2017. Jenner said that while she chose to write about her own decision in the book, she emphasized that it is personal and private. After she came out as transgender, Jenner received widespread praise, but then stumbled through several pitfalls in trying to navigate the sensitivities of her new world. Her transition was the subject of her E! docu-series, “I Am Cait,” which tackled some important issues in the transgender community, but was also accused of being tone deaf for including scenes with makeup, clothes, drinking wine and “problems of privilege.” It was canceled after two seasons. Despite those criticisms, Jenner said she still feels and sees the hardships facing the transgender community today. Jenner has been the target of not only relentless paparazzi but also transgender supporters who claimed she was not representative of their community. Jenner said there have been vicious attacks against her online. Jenny Boylan, a professor and GLAAD board chair who also appeared on “I Am Cait,” and author of the new novel “Long Black Veil,” said Jenner “absolutely” saved lives by going public with her story. In the two years Jenner has grappled with her new identity, the country has erupted with debates over transgender rights, from wading through proper pronoun usage to facing North Carolina’s “bathroom bill” controversy. While all of this seems confusing to some, Boylan, herself transgender, said it can be a threat for others. “The fear is that the world is becoming an unstable place and that if there's anything that we can depend on, it's that there are men and that there are women,” she said. Jenner, a lifelong Republican, admits that she voted for candidate Donald Trump in the 2016 election, saying it was because she thought he would bring jobs and a smaller government, and she supported his inclusion of the LGBT community. But Jenner said Trump broke her trust when, about a month into his presidency, he repealed an Obama-era directive to make it a civil right under Title IX law for transgender people to use the bathroom of their choice. And Jenner did go public, posting a video on YouTube in which she called the “bathroom bill” controversy “a disaster.” She said she has not spoken to Trump since she said hello to him at an inauguration cocktail party. Over the past two years, Jenner said she has learned a great deal about the transgender community, including what are acceptable or appropriate questions to ask or topics to cover, from talking with experts, other transgender people and parents of transgender kids. ABC News recently hosted a small event where Jenner had a conversation with parents, school administrators and religious community members to talk about both sides of the debate. Jenner said that moving forward she wants to concentrate on raising money for transgender causes. She has already raised $1.3 million with MAC Cosmetics and said she wants to ask other corporations for help. Jenner is also starting a foundation, the Caitlyn Jenner Foundation, to support transgender causes. But she fears this country will not see “full acceptance” of transgender rights in her lifetime. Jenner said she has no regrets about her transition. She dedicated her memoir to her brother, who died right after the 1976 Olympics, and her father, a decorated soldier who fought in World War II.